“Wealth” means having an abundance of something desirable. This can be tangible, like money and property, or intangible. Just because something does not have a monetary value does not mean it is worthless. Having strong connections with friends and family is often considered a major component of wealth – since these things cannot be bought or sold, they are “intangible”. Companies also have intangible wealth. For example, if the public opinion is generally positive, this is an asset the company has even though it might not be possible to assign a specific dollar value to that goodwill. If you can buy and sell something, then it has a tangible (meaning “can be obtained”) value. Tangible Wealth includes things like cash, bank deposits, property, stocks, bonds, and more. When you are building wealth, you want to start building up your assets, both monetary and non-monetary. Your “Monetary” assets are the ones that will be part of your spending plan – how much cash you have in the bank, how much income you are going to get next month, and how much money you currently have in your emergency fund. Since we can spend these funds on a very short notice, they are also called “Liquid Assets”. Stocks and bonds, which are less liquid, are also considered “monetary assets” because you will almost always know their exact value in dollars. Your “Non-Monetary Assets” are less liquid – you usually cannot spend them directly, and it takes some significant time to do so. This includes things like property, furniture, machines, and vehicles. All of these items are useful and definitely have some value, but until you actually need to sell them you might not know exactly how much cash you can convert them in to. Both of these contribute to your total wealth. For most people, their “non-monetary” assets will be the biggest chunk of their total wealth, usually counted as their car, house, property, and stuff they own. The idea of “Building Wealth” is referring to tangible assets. This means building up reserves of cash, bank account balances, and investments like stocks and bonds. Building up assets is a lifetime goal, usually accumulating bit-by-bit with sound personal finance strategies. By using techniques and tools like Budgeting, using a Spending Plan, and Investing, people can “put their money to work” and start earning more than just their base salary. Setting, and keeping, financial goals is one of the keys to building wealth. For example, a starting goal to kick-start your investments would be to find a way to save up $300 to use to buy your first stocks. 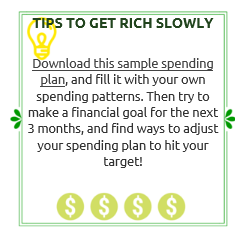 To do this, you can take a look at your spending plan, and identify places where you can trim off a few dollars each month from your variable (and sometimes fixed) spending, and see how quickly you can reach your goal. By having these goals, it gives an extra incentive to keep control of your spending, which is a major key to maximizing your savings and building up assets. 1 of 3) What is the biggest advantage of making financial goals? 2 of 3) How do non-monetary assets contribute to net worth? 3 of 3) Which of these is the most effective way to build wealth?